The fall season is upon us. Leaves are changing color and we’re seeing changes in the gardens and landscapes of our homes. Fall is an exciting time and conjures up images of apples, pumpkins, warm food, hot beverages and, for many of us, football games. Cooler temperatures change the many ways we use outdoor living spaces. Here are several creative ideas to help you enjoy more outdoor living time during the cool days and nights that are ahead. An outdoor living space can extend the time we spend outdoors enjoying the changing seasons with family and friends. 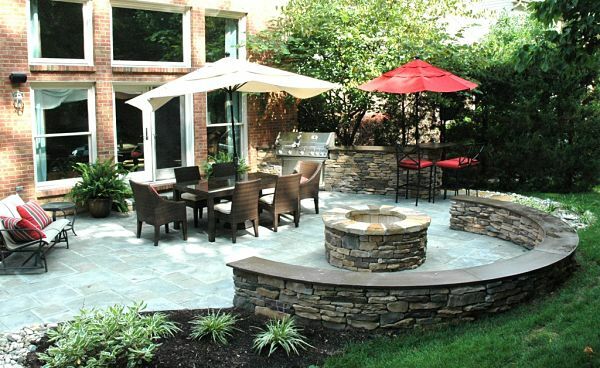 A sheltered patio, firepit, grilling area and outdoor seating provide a place to gather on a cool day. Custom built firepits are one of the hottest trends in outdoor living space design. A firepit can be either gas or wood fueled. It can be designed to include seating, placed on a patio or further into a yard to take advantage of the landscape and gardens. 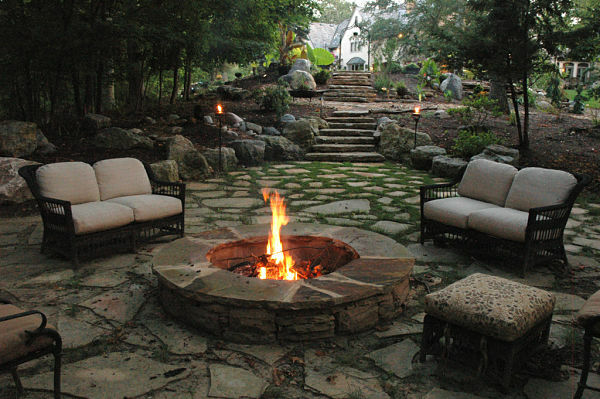 A firepit is a great place to gather on a cool day or evening. This wood-burning firepit blends beautifully with the rock garden of a French-country style home. What a wonderful way to enjoy the outdoors in any season. 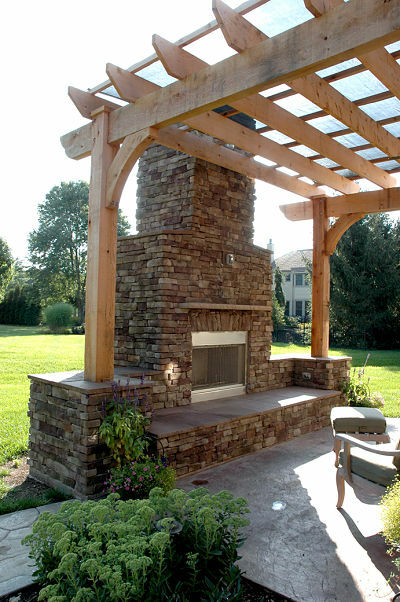 Outdoor fireplaces require a chimney and add an architectural feature to a yard. They enable us to take full advantage of being outdoors, even during winter months. Outdoor fireplaces can be either wood burning or gas fueled. A gas-fueled fireplace was built on the edge of a patio and is connected to the house by a pergola. This space can be used for three seasons. The fireplace can be turned on and the flame adjusted by a remote control. Many people enjoy grilling year-round. Outdoor appliances have extended the barbeque season beyond summer. In addition to grills you will find refrigerators and sinks designed for outdoor use. 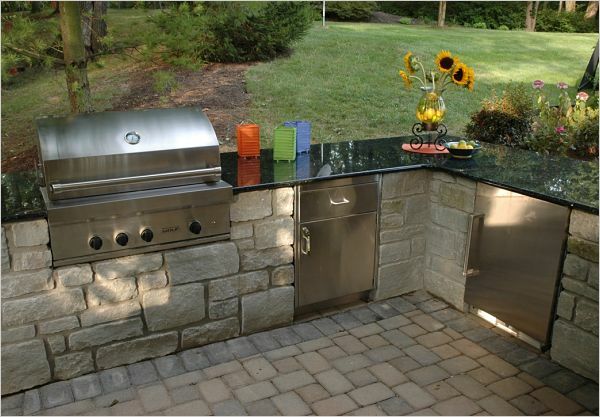 Add a granite counter for food prep and you will have a full service outdoor kitchen. This custom-built outdoor kitchen includes a grill, refrigerator, a storage cabinet and counter. Outdoor gathering spaces include areas for dining, seating, cooking, a bar and even a fireplace or firepit. A patio can be designed to accommodate these functions. It can be open or sheltered by a roof. 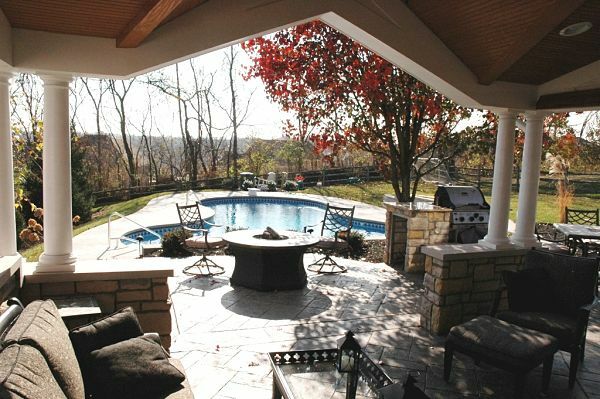 This multi-purpose patio features a gas firepit with seating, a bar, an outdoor kitchen and room for a crowd to gather. 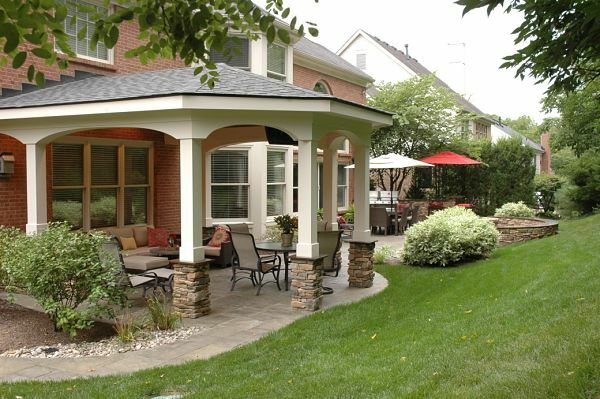 The patio is integrated with an open porch that provides shelter from the elements if the weather should change. Outdoor spaces have become more purposeful and refined. Porch additions continue to evolve and are being built with stronger materials and more amenities including lighting, ventilation and heating. Sources of heat include fireplaces and heat lamps. 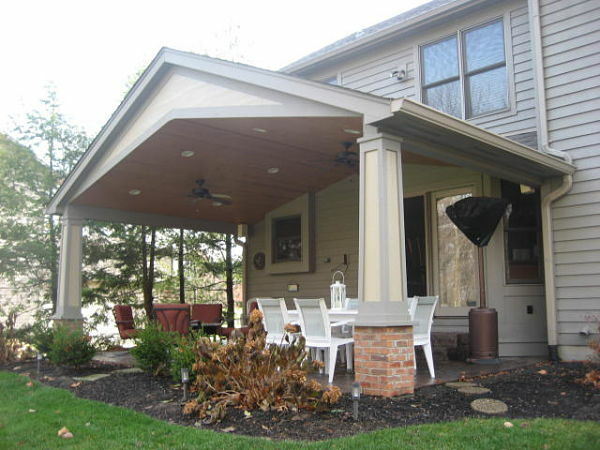 A porch addition can be built to optimize a spectacular view of a lake, landscape or garden. This porch addition provides an unobstructed view of a lakefront. The Arts and Crafts design of the supports and roof blend with the architecture of the home. Ceiling fans circulate air and recessed lighting illuminates the space. A heat lamp provides comfort on cool days, especially in the fall when the view is at its peak. 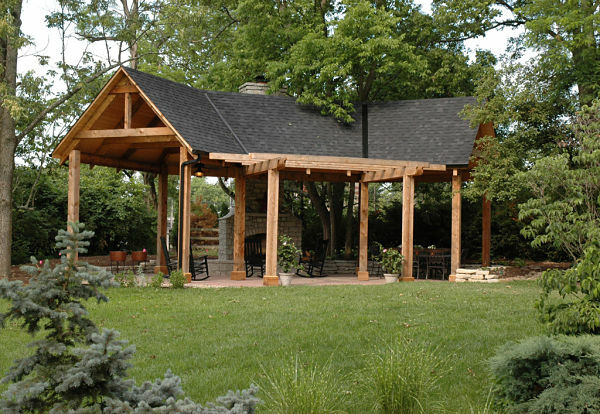 If you love the outdoors, a detached shelter can be used during almost every season of the year. Shelters are often built to blend with the natural surroundings and can include a fireplace, areas for sitting and picnics, or outdoor cooking. This shelter was expressly designed to complement the tall trees in this landscape. It is rustic with hewn support posts and a stone wood-burning fireplace. The homeowners added rocking chairs for “fireside chats.” Ceiling fans provide lighting and ventilation and divert flying insects. The ultimate in outdoor living is an outdoor room with all of the comfort you may find indoors. Just imagine an outdoor space built to augment the architecture of your home with a fully equipped kitchen, bar, fireplace, seating and dining areas, and even a television. 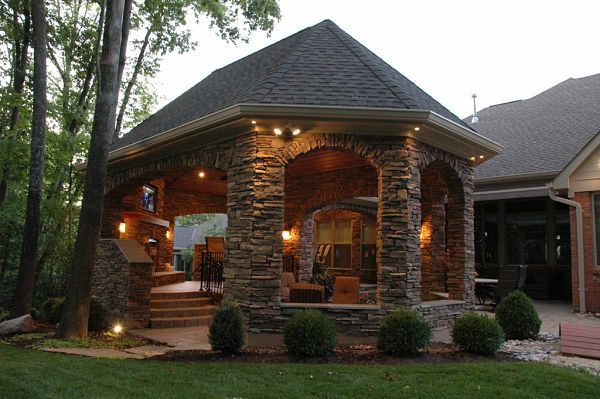 A stone gazebo has everything you may want in an outdoor room. There is a kitchen with plumbing and outdoor appliances, granite counters, a bar, a television viewing area, a fireplace, a conversation area with a firepit, and a dining area. Click here to see more of this spectacular outdoor living space.